Clitheroe Rugby Club’s 40th season got off to possibly one of the wettest starts in all those four decades. Fortunately it did little to dampen spirits, scoring four tries to beat Burnley seconds 32-17. Clitheroe found themselves under the cosh early on, and some disjointed communication in defence was evident as Burnley scooted in with two unanswered tries before half an hour. Clitheroe’s woes deepened when influential No8 James Haynes was forced to retire with a shoulder injury, replaced by debutant John Norman. Some loose kicking out of defence brought full back Martin Lafranceschina into the game, and he cut a lovely line which carved open the defence to open Clitheroe’s account. When evergreen Kiwi back rower Darren Eagle superbly effected a turnover deep in their own 22, the ball was moved to the left. Chamberlain straightened the line and drew the defence and with speed merchant Chris Stewart lurking on his shoulder it seemed game over. The wing man still had plenty to do skipping out of a few tackles to score just on the stroke of half time. On paper the game still seemed in the balance with Clitheroe just two points behind. But there was the feeling that there was much more to give and that their superior fitness would a deciding factor in the Littlemoor mens favour. The majority of the second half belonged to Clitheroe, and while they only had a further two tries to show they seemed in control. A couple of penalty kicks from the steady boot of Peel gave them a lead and frustrated the home team, who seemed to incur the displeasure of the referee. Clitheroe were themselves as guilty and in the same boat here last year and proved that getting on the wrong side of the official only compounds problems. 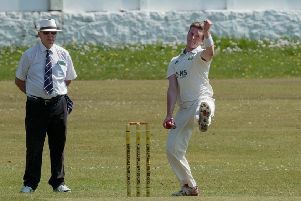 It was not all perfect for Clitheroe and there were several areas that need to be addressed for future but they managed to overcome their difficulties on the day. After James Dickinson limped off from the left wing, his ready replacement David Seed scored with almost his first touch of the ball – not a classic wingers try perhaps – but burrowing over from short range will do. Now in the closing stages Clitheroe scored the try of the day. Chris Stewart tracked back to field a speculative kick deep in is own half. He then set off on a mazy 70 metre run seeming to out run the defence before he appeared to slow dramatically. With the cover defence almost snuffing out the chance, up came lock Lewis Hardman in support to claim a well deserved try. With the clock up Burnley showed plenty of grit to camp on the Clitheroe line and were well rewarded with a try of their own at no side. So a decent win with bags of character on show; a good start to Season #40.